This summer, six Eastern Senior High School students from the school’s innovative Health & Medical Science Academy (HMSA) served in internships this summer with MedStar Health via the Rx for Success program. The students worked across MedStar Health in Neurosurgery, the Cancer Institute, the SiTEL lab, as well as in nursing and rehabilitation. These internships are the end of a year-long, competitive ‘Easternship’ program coordinated by CforC and supported by our corporate partners. The ‘Easternship’ program is designed to build upon lessons that the students learn throughout the year in the classroom. Through the program, CforC brings in corporate and nonprofit partners to provide professional development lessons. The lessons, including topics ranging from communication and etiquette to resume writing and interviewing are designed to help students prepare for success in a professional workplace. AE Works is excited to be a steering committee member of B Local: Mid Atlantic, a group of Certified B Corps from DC, Maryland, VA, PA and beyond working to foster connections among organizations in our region who share our purpose and passion for using business as a force for good. As a part of our involvement, we have helped organize events to help businesses act on their purpose to achieve social and environmental impact. At our B Local Mid Atlantic panel discussion in May, The Impact of Diversity, Inclusion & Equity in the Workplace, our panel from B Corps and Non-profits offered diverse perspective and insights on what being an inclusive company means, why it matters and what offered ideas for attendees to bring diversity into their organizations. Students at Miner Elementary (601 15th St. NE) got a special delivery on March 22 –boxes and boxes of books to kick off Literacy Week for the school. Thanks to a donation from Companies for Causes (CforC), a philanthropy-focused organization of corporations, the students will receive four to five classroom library collections worth of books to contribute to improving literacy in the District’s public schools. CforC bought the books from Science Naturally (725 Eighth St. SE), using about $1,200 raised during a “Books for Kids” campaign in the spring of 2016 on Capitol Hill. In DC, the quality and availability of books varies considerably from school to school, said Joe Weedon, Ward 6 State Board of Education representative and a CforC member. CforC wants to change that starting in Ward 6 schools. “Many of the schools do a good job of providing support, but I think we can do things on a bigger scale and looking across communities,” Weedon said. CforC chose Miner for its latest donation because of the school’s relationship with Eastern High School (1700 East Capitol St.) and its low Partnership for Assessment of Readiness for College and Career (PARCC) scores in 2015 and 2016. Only 9 percent and 10.1 percent of Miner students met or exceeded standards for English language and arts and literacy skills in 2015 and 2016, respectively. Helping at a 2016 summer camp for disabled children, Eastern High School student Kaheri Gyenyame, a senior and Ward 4 resident, realized doctors and nurses make up only part of the career options in the medical field. Gyenyame traveled with hospital staff and worked with children as a part of her six-week internship through MedStar Health’s Prescription for Success partnership program with Georgetown University Hospital and Eastern High School’s Health and Medical Science’s Academy (HMSA). Philanthropic investment group Companies for Causes coordinated the program. Gyenyame and 11 other HMSA students interned 20 to 25 hours a week, a paid position through DC’s Summer Youth Employment Program (SYEP). They spent their time observing the doctors, nurses, and other medical staff, as well as attending workshops on professional development such as resume writing and interview and college preparedness training. At the camp for disabled children, Gyenyame watched as physical therapists, counselors, and other staff showed the children how to play the same sports she plays with her own friends. 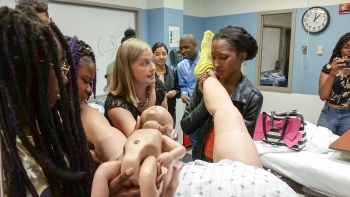 She plans to study medicine and go into pediatrics, and seeing the variety of expert roles needed to care for the whole child showed her a range of future career options. “I knew it would be an insightful and hands-on experience,” Gyenyame said of the program. Great experience. Inspiring. Defining moment for our students. These are the words of five Eastern students who, thanks to Hooks Book Events, saw Ta-Hehisi Coates speak. The students all really enjoyed the talk with Mr. Coates. He addressed issues of race, racism, inequality, parenting, education, politics, and so much more. As a teacher, it was moving to see how engaged our students were in the subject matter and to hear their reactions to the talk afterwards. One of the best teaching moments I’ve had for sure. Two of our students had just completed reading “Between the World and Me” and the other students began reading it right after the night’s event. They all are now eager to read more of his writings and are curious about attending other discussions with writers. This past week, the Nation’s Report Card was released. As the Washington Post concludes about Washington, DC’s scores on the National Assessment of Educational Progress (NAEP), “the District offered a bright spot in the otherwise bleak results, as one of just two jurisdictions that posted gains on two tests. 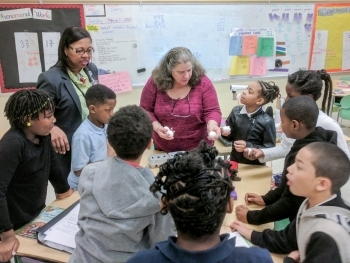 Fourth-graders in the District made significant strides, climbing three points on the national math test and seven points on the reading test.” This marks the second time in a row that the city has stood out for its improvement on the NAEP. It’s difficult to accept that our educational systems are not preparing our students for college and careers, but it’s a reality that we need to acknowledge and work hard to reshape. This is the first year of the new Partnership for Assessment of Readiness for College and Careers, or PARCC, and the District of Columbia State Board of Education set a high bar. The State Board set the bar at a Level 4, meaning that students “met expectations” and are ready for college or the workforce without remedial education. As anticipated, the District’s scores on the PARCC exam are far lower than recent scores on the DC CAS, the District’s previous standardized test. Earlier this month, the District of Columbia reported that graduation rates for the Class of 2015 reached 64%. Graduation rates at Eastern Senior High School, Companies for Causes’ partner, exceeded the District’s average reaching 69%. Companies for Causes partnered with Eastern in 2011 and our CEO’s hands-on efforts and financial support for Eastern High School have contributed to this success. However, we realize there is still more to do. On September 25th, Companies for Causes honored 171 Eastern Ramblers for their academic achievements during the 4th Quarter of the 2014-15 School Year. Thanks to Geppetto Catering, who has provided meals for Honor Assemblies since Eastern’s Relaunch in 2011. CforC also provides honor pins for all students who achieve Academic Honors. Companies for Causes places a high value on school culture and is proud to reward students for their hard work and high academic achievement. Thanks to Company for Causes, one of the UK’s most successful inner city school programs is taking root in Washington DC. Dr. Tania Nguyen, The Brilliant Club-DC’s founder, is working closely with Companies for Causes as well as teachers, community organizers, and PhD mentors to put middle and high school students from the Capitol Hill area on a proven track to top-tier universities.